Well so much has happened in the past 2 days. Reports coming in from Breyden and the support crew are that it's been pretty hectic in Golden for the past few days. When I texted him yesterday he indicated there were a lot of meetings planned for today and he wasn't kidding. There is lots going on!! So after a 15 kilometer walk to Golden yesterday, Breyden stopped in at the Information Center where he was greeted and interviewed by the manager of the center, Lynne Romano. She was excited to meet Breyden and wants to be able to relay his fundraising story to visitors. She will also be posting the full interview on their facebook page. I'll put up a link to that later so you can be sure to 'like' Golden. 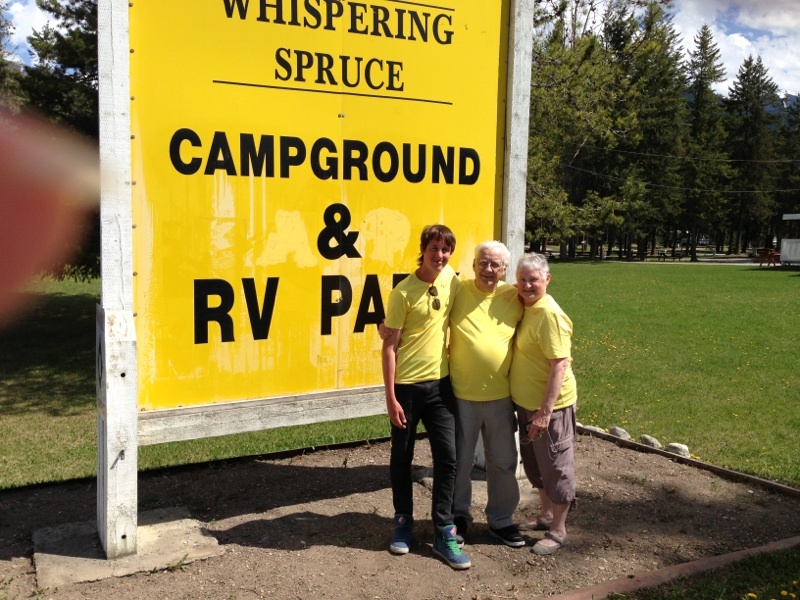 Then the team headed off to get the RV registered and set up at the Whispering Spruce Campground. After hearing what Breyden's walk was all about the manager, Pat, offered to donate to the trip expenses by providing a free night's lodging at the RV park. I took a browse though their photo gallery on the web page. It is a beautiful park, and they have most amazing lawnmower I've ever seen. Check it out on their web site. 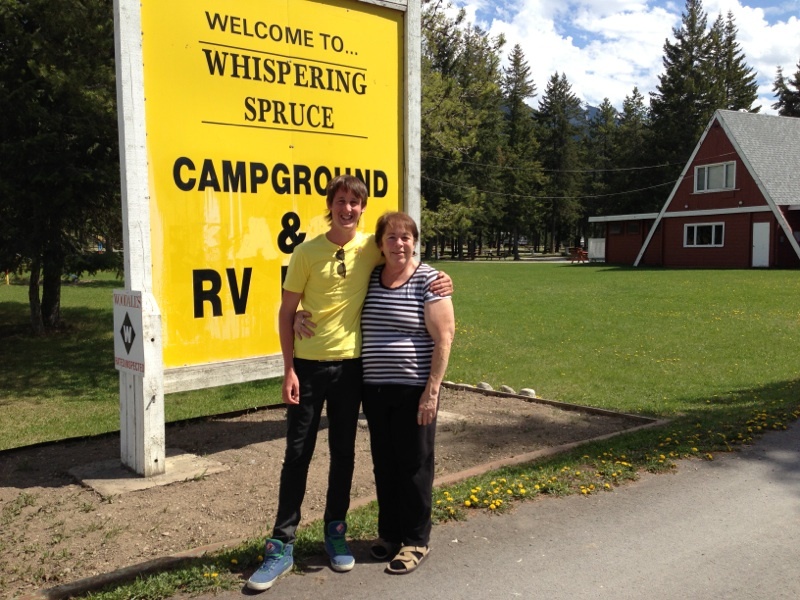 Whispering Spruce Campground. Today was even more eventful it seems. Breyden met with the Mayor of Golden, Christina Benty and had a chance to talk with her for a while about his walk and his plan to raise funds for cancer research. Despite having just returned from a course and having a lot of work to catch up she still took the time to meet with Breyden and welcome the whole team to Golden. After that, another interview and some photographs with Darryl Crane, the Editor of The Golden Star. I'm looking forward to reading his interview in the next edition. 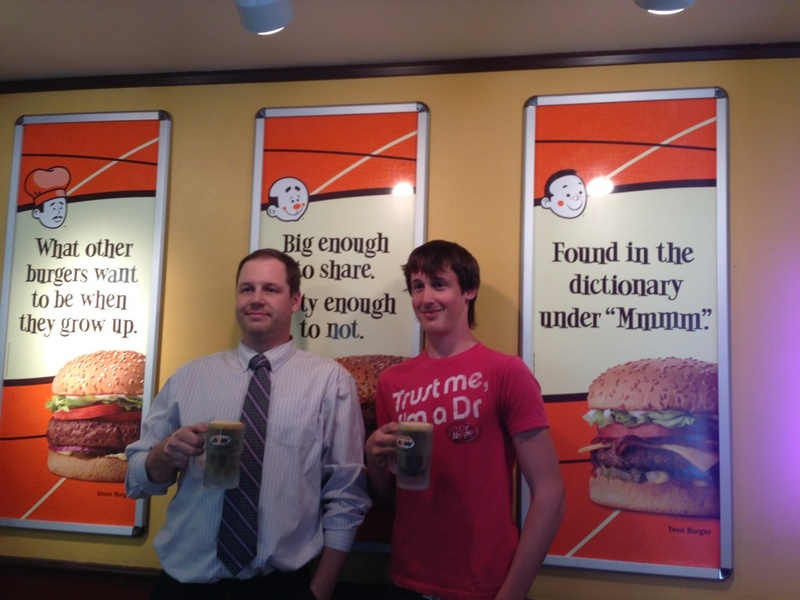 The management of the local A&W in Golden heard about what he was doing and provided lunch for Breyden and the support team. I must say that I am really amazed at the generosity and interest expressed by so many local merchants in all the towns Breyden is visiting. So many people are helping out by contributing accommodation, meals or even making cash donations along the way. There are some expenses incurred along the way to keep Breyden walking and every bit helps and is truly appreciated by all. But the message that Breyden most wants to get out there is that he is doing this to raise funds for the Canadian Cancer Society to help find a cure for cancer. He has a good friend who is affected by this disease, as do I and as does almost everyone. Cancer is still far too present in our lives. If you can, please donate. Every amount donated here goes directly to the Canadian Cancer Society. Loving the Daffodil yellow team shirts! and what great support you are getting from businesses!